Today we are pleased to announce the 1.4.2 release of ClusterControl - the all-inclusive database management system that lets you easily deploy, monitor, manage and scale highly available open source databases - and load balancers - in your infrastructure. And more! Read about the full details below. This maintenance release of ClusterControl is all about consolidating the popular database management features our users have come to appreciate. And we have some great new features aimed at DevOps teams! Our new integration with popular incident management and chat services lets you customise the alarms and get alerted in the ops tools you are already using - e.g., Pagerduty, VictorOps, Telegram, Opsgenie and Slack. You can also run any command available in the ClusterControl CLI from your CCBot-enabled chat. ProxySQL can now be deployed in active standby HA mode with Keepalived and Virtual IP. 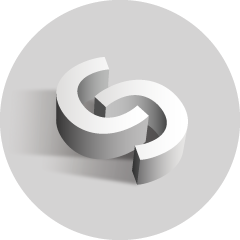 It is also possible to export and synchronize configurations across multiple instances, which is an essential feature in a distributed environment. And we’re introducing automatic failover and replication management of your PostgreSQL replication setups. In our previous ClusterControl release we included the new ClusterControl command line client (CLI). We have now made a new and improved CCBot available that has full integration with the CLI. This means you can use any command available in the CLI from your CCBot-enabled chat! The command line client is intuitive and easy to use, and if you are a frequent command line user it will be quick to get accustomed to. However, not everyone has command line access to the hosts installed with ClusterControl, and if external connections to this node are prohibited, the CLI will not be able to send commands to the ClusterControl backend. Also some users may not be accustomed to work on the command line. Adding the CLI to our chatbot, CCBot, addresses both problems: this will empower those users to send commands to ClusterControl that they normally wouldn't have been able to. Alarms and Events can now easily be sent to incident management services like PagerDuty and VictorOps, or to chat services like Slack and Telegram. 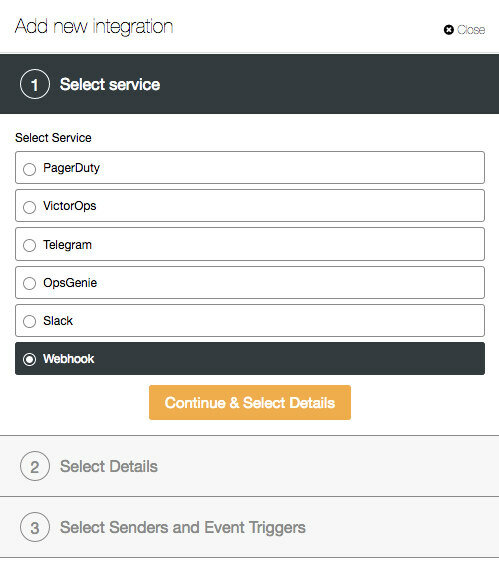 You can also use Webhooks if you want to integrate with other services to act on status changes in your clusters. The direct connections with these popular incident communication services allow you to customize how you are alerted from ClusterControl when something goes wrong with your database environments. 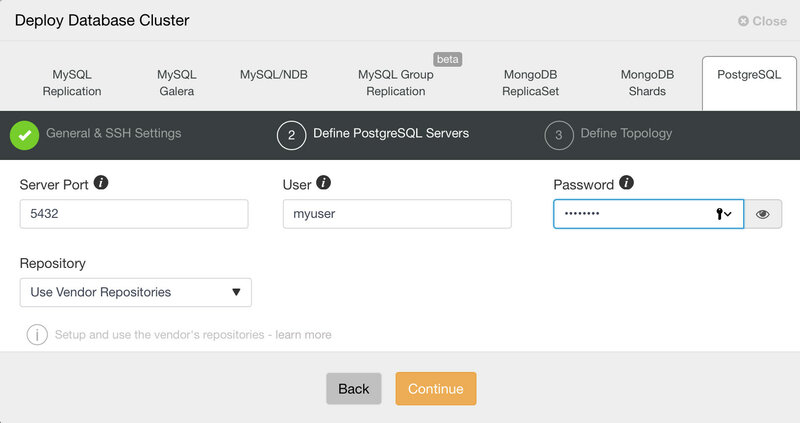 Starting from ClusterControl 1.4.2, you can deploy an entire PostgreSQL replication setup in the same way as you would deploy MySQL and MongoDB: you can use the “Deploy Cluster” menu to deploy a primary and one or more PostgreSQL standby servers. 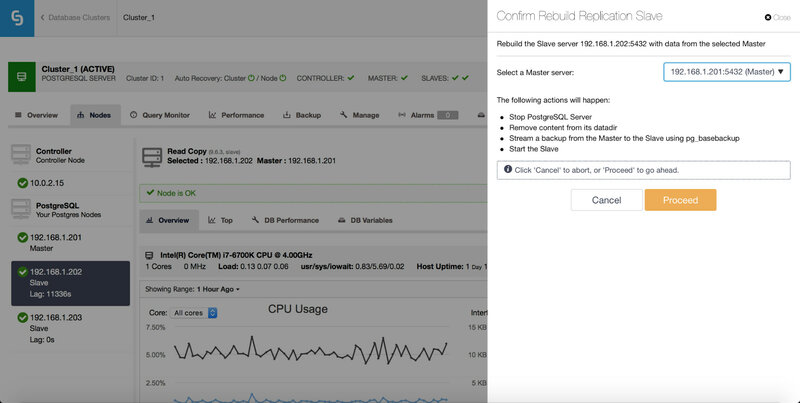 Once the replication setup is deployed, ClusterControl will manage the setup and automatically recover failed servers. Another feature is “Rebuild Replication Slave” job which is available for all slaves (or standby servers) in the replication setup. This is to be used for instance when you want to wipe out the data on the standby, and rebuild it again with a fresh copy of data from the primary. It can be useful if a standby server is not able to connect and replicate from the primary for some reason. You can now easily check which queries are responsible for the load on your PostgreSQL setup. You’ll see here some basic performance data - how many queries of a given type have been executed? What was their maximum and average execution time? How the total execution time for that query looks like? Download ClusterControl to get started. In this release we have improvements for ProxySQL to help you deploy active/standby setups with Keepalived and Virtual IP. This improved integration with Keepalived and Virtual IP brings high availability and automatic failover to your load balancing. And you can also easily synchronize a ProxySQL configuration that has query rules, users, and host groups with other instances to keep them identical. From the ClusterControl GUI, you now have SSH access to any of the database nodes right from your browser. This can be very useful if you need to quickly log into a database server and access the command line. Communication is based on HTTPS, so it is possible to access your servers from behind a firewall that restricts Internet access to only port 443. Access to WebSSH is configurable by the ClusterControl admin through the GUI. PS. : For additional tips & tricks, follow our blog: https://severalnines.com/blog/.